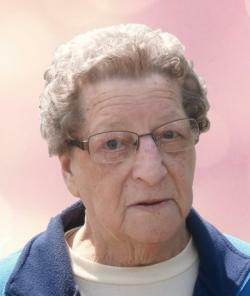 Greta G. Harrison, 88, of Harrison Settlement Road, passed away Thursday, March 14, 2019 at her home. Born in Forest Hill, she was the daughter of the late Ernest A. and Ada P. Harrison. She was an avid knitter and noted for her quilt making. Greta was a chosen mother to many. She is survived and sadly missed by several nieces and nephews. She was the last surviving member of her immediate family, predeceased by brothers, Frank, Arnold, Ennis and Von; sisters, Muriel Humphrey, Lena Chown and Thelma Rogers. A Graveside Service at Harrison Mountain Cemetery with Pastor Paul Beaman officiating will take place at a later date and will be announced. Funeral arrangements are entrusted to Salisbury Funeral Home, 3350, Rte 106, Salisbury West (372-4800). In lieu of flowers, donations to Harrison Mountain Cemetery or the Heart and Stroke Foundation or donor’s choice would be appreciated.